Leeds, UK: Peepal Tree Press, 2016. There is a long line of madwomen in Caribbean literature. Notwithstanding the overarching saturation of madness in the canon in general or masculine representations of madness in particular (Walcott’s Makak or Naipaul’s Man-Man for example), there is a tradition of the female embodiments of madness I first noticed in Miguel Street, but found persisting in various forms in Wide Sargasso Sea and later The Last Warner Woman. Laura. Bertha. Adamine. Despite the scholarship excavating the distinctly genderphobic diagnoses of madness and psychoses projected onto women in Victorian times, in Disturbers of the Peace: Representations of Madness in Anglophone Caribbean Literature, Kelly Baker Josephs argues that this sustained pervasiveness of insanity is a fundamental portion of the West Indian literary aesthetic. It is upon this tradition and this aesthetic that Shara McCallum grafts her fifth collection, Madwoman (Alice James/Peepal Tree), to devastatingly haunting effect. The stereotypical virginal innocence expected from literary representations of the girl-child is steered clear of, and instead, McCallum imbues the figure with the contrasting and competing qualities of admiration for the flower’s beauty and the primal desire to destroy it. 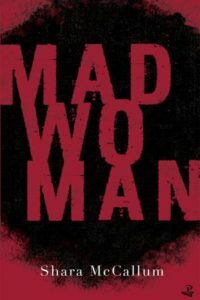 In this, and other poems, the Madwoman is embodied simultaneously by such creative and destructive forces. It may be apt then to imagine her as a sort of creolised Kali figure. McCallum’s universe is one that we all inhabit. Her Madwoman is haunted by the traumas of the past – all its ruined houses and minds –just as all citizens of postcolonial landscapes are. What this collection ultimately accomplishes is a portrait of a myriad of social constructs around blackness and gender with such breath-taking clarity that it compels and challenges us to embrace our own psychic unravellings as a font of strength and creativity.